Hydration has been the theme for my skincare these past months. Hydration and layers, layers, layers. I definitely prefer it over moisturizing products since my oily skin can only handle so much. Heavier products tend to only stick around the colder months of year for me. I've not really had the time to sit down and write up posts about products that have been helping my skin, especially new holy grails I've found. 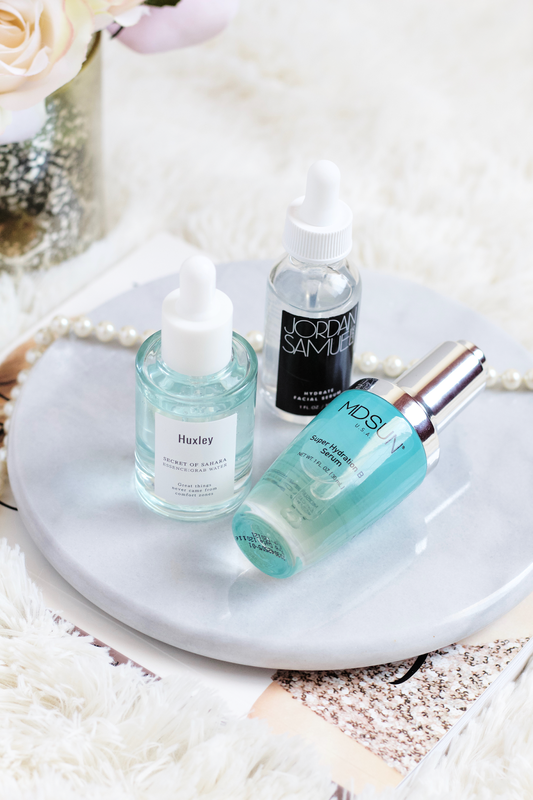 So I thought I would introduce three brands that haven't been on my blog before and their products that I've been relying on to help my skin. 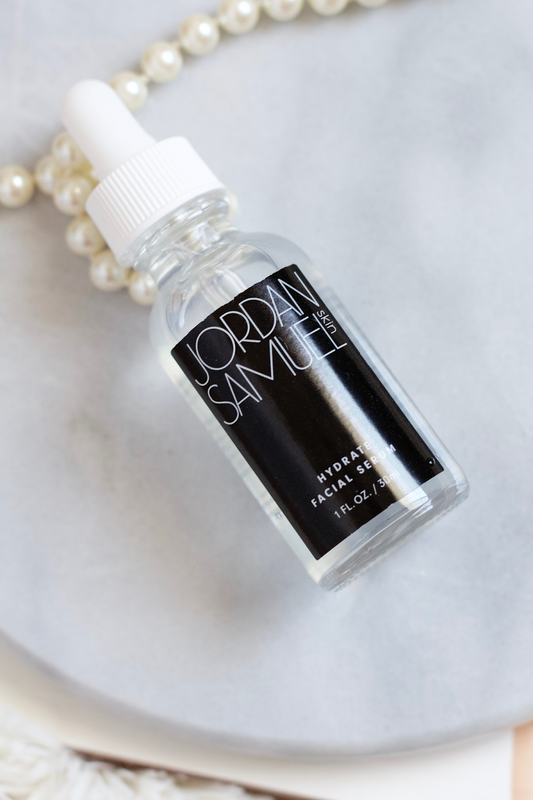 Jordan Samuel Skin is a brand I found through the green beauty community on Instagram. I first heard about his much hyped Plié Treatment Cleanser, then found out he also sells two other products, Hydrate Facial Serum and étOILe Oil. I was really interested in hearing more about Jordan's background, from him being a former professional dancer to becoming a leading esthetician and opening up his own skin clinic. I appreciate Jordan keeping his prices low by directly selling his products to consumers, instead of going through retailers and having to raise his prices. I think more than ever it's important to be aware where you're putting your money and support, Jordan's brand being one where I can put my trust. Jordan also has a youtube channel where he uploads videos talking about skincare and has a few talking about his products (Plié Treatment Cleanser, Hydrate Facial Serum, and étOILe Oil). Jordan's products are cruelty free. Hydrate Facial Serum is a vegetable-based hyaluronic acid gel serum. Compared to the two other products I'll be talking about, this is the most dense but absorbs without feeling too heavy or that anything is abruptly sitting on top of my skin. This serum includes botanicals like organic aloe, tamarind extract, cucumber extract, passion flower extract, and willow bark extract. Also included is a stabilized form (1, 2) of vitamin c, sodium ascorbyl phosphate. It has no scent and no added fragrance. The natural humectants mixed with botanical extracts really have made this serum a wonderful addition to my routine during these colder months. I think what I most enjoy about this serum is that it feels very fresh and cooling whenever I use it. Products layer like a dream afterwards and I never have a problem with piling. It feels like the perfect balance of weight for my oily skin, not too light and not too heavy. It doesn't leave any sticky residue either, so that's a major plus. My skin feels really hydrated afterwards, not overly hydrated but just enough where I'm content and I can see the plumpness even when I wake up. I always used to think that hydrating targeting products would be a waste for me to invest in but I can see that I was wrong, I'm really in love with this product and the results it gives me. I also appreciate that the dropper is quite long so that it reaches far into the container. I do recommend trying this product out from Jordan! I'll have a review of his Plié Treatment Cleanser once I've used it more. MDSUN was another skincare brand I found through Instagram. I was first approached by their PR team to try out their Brightener Serum* a while back, which I really like and will talk about in a different post later on. They reached out to me again recently and asked if I would like to try another product of theirs, this time one of their best sellers, the Super Hydration B Serum*. I've been using it since late February. 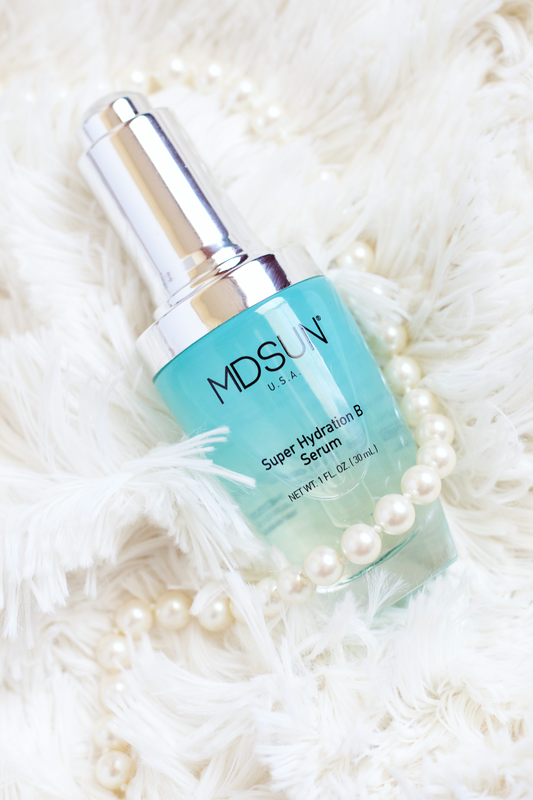 Super Hydration B Serum is a thin hyaluronic acid serum that deeply hydrates the skin. This serum is aimed for dry, oily, combination, sensitive, and problematic skin with acne and hyperpigmentation. I enjoy using this in the mornings since it has such a water-y consistency and absorbs so quickly. It has a clicker on the top, the first of any product I've used with this function. It takes in a lot of the product from the container, so you don't need to drop a lot of it. My makeup applies easily over this and doesn't add to my oiliness, rather I feel like it balances and evens everything out. It especially sits well under my matte sunscreen. While I do prefer to use heavier serums at night, I also sometimes like to incorporate this into my P.M. routines since it makes my skin very soft and plump due to the number of humectants. I do think it adds a radiance, not so much brightness, but more like you've had good rest and your skin looks healthier. I do have some constructive criticism that I hope they will implement in the future for those interested in trying this product. They do not have the full ingredient list available on their website, which in my opinion is a big negative. I think it would be very beneficial for them to include it and make it available for everyone before committing to buying the product. I've included it here, as I always do in my posts with skincare, straight from the box. I've been interested in Huxley for a long while now. Glow Recipe was the first U.S. retailer I saw stock their products and it's where I purchased the two items I have from them. They have two videos on their youtube channel featuring Huxley, here and here. I knew that I wanted to try the Grab Water Essence after seeing that it was a gel-type since my oily skin really does better with that consistency. I also have the Oil Essence and will be talking about it in a future post. Grab Water Essence is a light-weight water-gel essence featuring organic Sahara cactus extract. This essence uses Opuntia Ficus-Indica (Indian Fig) extract and seed oil, providing natural moisturizing factor (NMF) with ceramides and sodium hyaluronate to increase hydration retention. The prickly pear extract also has ample antioxidant benefits. The other ingredients such as grapefruit, peppermint, camu camu, acai fruit oil, bamboo tree sap, yerba mate leaf, and Japanese apricot help to create a refreshing and soothing product. This doesn't make your skin sticky or greasy, it dries a bit matte but isn't drying at all. Your skin will feel very soft and plump for the next skincare routine steps. I use about 3-4 drops for my whole face. This does smell a bit like alcohol, so keep that in mind if you're sensitive to scents. While this is a gel consistency, it also is a bit runny like water, so the 'water-gel' description is really on point. Alike to Jordan Samuel Skin's Hydrate Serum, it feels very cooling on the skin. I think due to it being a water-gel type it's able to add even more of that cooling feeling compared to the Hydrate serum. It may be a gel but it breaks down into a thinner water consistency as you apply it and work it into your skin. I can always expect a thrilling amount of hydration, it's a step of my routine that I really look forward to. It's light enough to use in the morning and I can easily multi-layer it with heavier essences at night. I like to pat it into my skin and doesn't take very long to absorb. For oily and combination skin types, this is the product to always have. Even when the unbearable heat comes during summer, I'm sure I'll still be using this then. This will forever be a repurchase. I hope these condensed reviews helped you get a sense of each product. They are great hydrating products and I really recommend you try them out, regardless of season. What are your favorite hydrating products? I'd love to know!